Mami-Eggroll: Hot freshly grilled burgers served right from my cube! Hot freshly grilled burgers served right from my cube! I have been having a serious craving for cheeseburgers all weekend/week long. 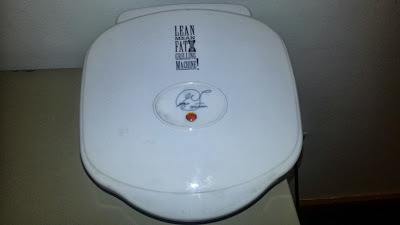 I went to gym at 5:30 AM yesterday morning and was ravenous when I got home. 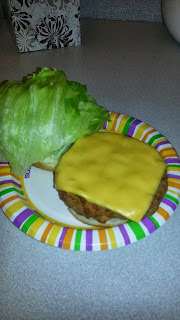 All I wanted was a cheeseburger, but how could I really bring a cheeseburger to work for breakfast without being judged. I settled for the cup of unsatisfying oatmeal but I had my heart set on a cheeseburger for lunch. Bobby Flay's Burger Palace recently opened its doors at the Burlington mall and I decided to give it a try to see if it will fulfill my cravings. 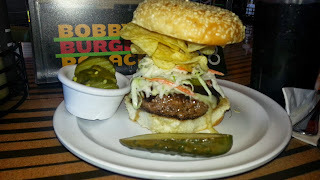 I ordered the Dallas burger "crunchified" , it was topped with coleslaw, pickles and potato chips. The burger was tasty but overwhelming. I'm quite the opposite when it comes to burgers, I prefer smaller burgers over big huge burgers. My favorites are white castle burgers or ones that you can find at at backyard BBQ in s small bun with a slice of cheese. For dinner, guess what we had? Cheeseburgers! 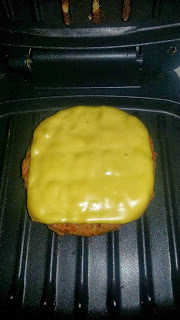 I cooked the 1/4 lbs burgers (even though I think they are smaller than 1/4 pounds) frozen burgers from the boxed Market Basket econo pack. They were just to my liking! Small and perfect! 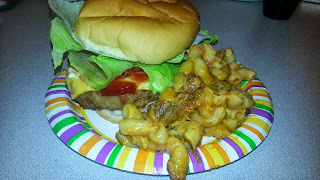 The last time the Mo and I were at Costco's, I picked up a box of veggie Lightlife Backyard Grill N' Burgers. We are currently going through an operation "clean out the freezer" so I packed some to bring to work. I didn't think a microwaved veggie patty would be tasty so I brought in a small George Foreman grill as well. I've been meaning to return it to my sister as it belongs to her but I've had it for years. Whatever, she still has my waffle maker! 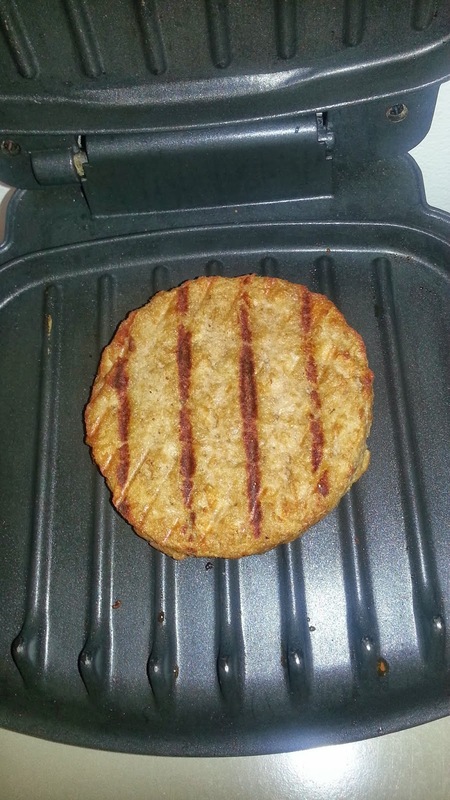 As I plugged the small electric grill and placed my frozen burger on it, my coworkers all walked by and chuckled, "Kim, is this really happening?" 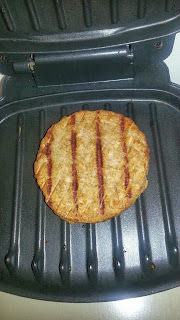 I went ahead and continued "grilling" and in less than 5 minutes, my veggie burger was ready to go. 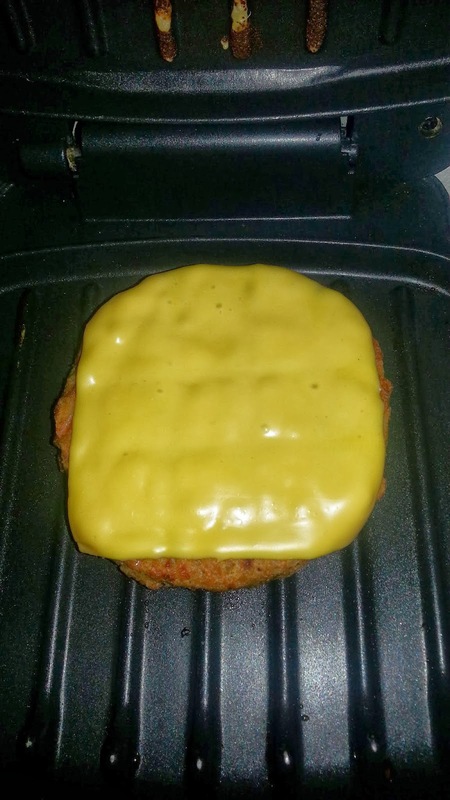 I threw a slice of processed American cheese on the burger and let it sit and melt for another minute and unplugged the grill. This is not exactly healthy food but it beats a regular cheeseburger or eating my usual cold sandwiches and salads for lunch. I topped off the burger with some fresh iceberg lettuce and raided the fridge for mayo and ketchup. I brought in some leftover pulled pork mac & cheese and served it on the side. 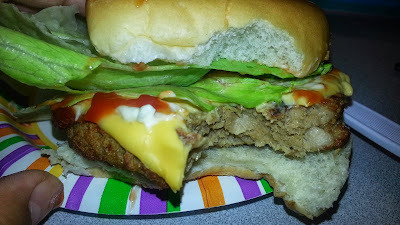 The veggie burger was absolutely delicious! It tasted like a REAL burger and there was no weird texture of after taste. It is by far, the BEST brand of veggie burger I've ever had.